The linen suit shown here is my most recent commission, from the sterling outfit that is now Kent Haste & Lachter. There is a blog; there is a group photo on the wall; there is a real spirit of enterprise. I have to say I’m very pleased for them (if that’s not too condescending). Interestingly the linen suit (13oz from W Bill) was made to the pattern that John Kent created for me, but was entirely fitted by Terry Haste. This is purely coincidence, and was a result of John not being around when I went in for fittings, but has led to a slightly different result to my first suit (which John fitted). John, for example, tends to fit a very close back. It looks beautiful, but allows less room for movement – particularly for me, as I like to wear my jacket while at my desk, arms outstretched at the computer. John also likes a slightly slimmer trouser, which is not tight but again allows that little bit less movement. The suit is half lined in the traditional English manner, that is a buggy lining with the foreparts lined and the back half lined in the same material. So not as much air flow as the Caliendo jacket last week, which is more like a quarter lining. But the linen is wonderfully cooling. My only other linen is a brown 9oz from Scabal which, while still nice, wrinkles very quickly and loses its shape too. It looks pleasantly rumpled, but its light weight means there is less linen to feel coolly against the skin. This heavier W Bill has been a revelation in that regard. Beautiful make, as you’d expect from KH&L (as the hangers now proclaim), and a three-patch pocket configuration that will make it easy to wear with lightweight grey trousers. I expect to do that as much as wear the suit in its entirety. 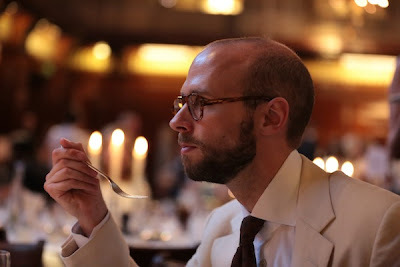 The photos are from the MTBA dinner again, and no, I don’t have any shots when I am not leaning comically forward so that the collar is standing away from my neck. Shirt, as with the Caliendo shots, by Kiton and tie from Church’s. Glasses by EB Meyrowitz. You can follow the discussion on Kent Haste & Lachter linen suit by entering your email address in the box below. You will then receive an email every time a new comment is added. These will also contain a link to a page where you can stop the alerts, and remove all of your related data from the site. An excellent look – quite ‘modern’ colonial in ivory coloured linen and if i may add, different from many others at the gathering. I am quite pea green with envy of that suit. One can instantly recognise that the weight of that particular linen is heavier than normal and i found it very interesting that it wears much better. This is worth knowing as linen can look somewhat too creased when in a lighter weight cloth, which i find makes the look appear cheap. I also know you are fond of brown and the tie provides a very pleasing combination. Strangely brown is a colour i never look to wear so this is a new avenue to invetsigate for me. I do have one criticism though. The opening of the jacket sleeve appears far too large in the photographs and personally, i would like to have seen this substantially reduced. Also, having enquired about your trousers from the last MTBA dinner review you carried out, these look very similar though i am sure you will tell me they are not. Are they indeed the same? If possible i would very much like to know the colour wave of the cloth. Thank you too for pointing out the different makers of your ensemble, i cannot tell you how helpful this is. Sleeve size is something I have given quite a bit of thought lately, as it really can only be cut to accommodate either a double cuff or a single cuff if one wants it to be tight. One of the problems of living in the real world I guess, the ultimate example of great “fitting” jacket cuffs are the ones Sean Connery wears as James Bond, they look so tight that they only would fit his Turnbull and Asser turnback cuffs (which are in this regard about the size of a single cuff), and not a double cuff. Hard to duplicate unless one has different jacket to accommodate different shirt cuffs! The suit looks lovely indeed! It seems to drape quite well. But isn’t it heavy for the Summer, especially with the lining? Even though I know that Brits – thanks to Mother Nature – do not have real Summer weather. So how could it be suitable under clims such as those of South of France, or Italy for that matter? I personally would tilt towards a kind of blend cotton / linien for Summer suits. Again, this outfit as the previous one also suits perfectly to the event. Yet as to shoes, for a change of pace I would opt for brown suede loafers. John, the weight makes it better for slightly cooler summers yes, say under 30 degrees. But cotton/linen wouldn’t be much cooler and would look much more casual. 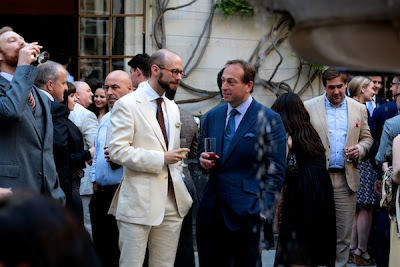 A lighter weight and constructed linen would be good for the south of France or Italy in summer. Many thanks for this very helpful advice, Simon. Upon reading this reply, I wonder whether it wouldn’t be a good idea to devote an entire post on Summer suits and / or jackets while bearing in mind the formality scale as you once did for shoes. For sure, I won’t be the only one to greatly appreciate it! I know the post is about your suit, but it’s your shirt that I find exceptional. The collar is magnificent. Thank you for noting the brand. I’m inspired to do some shopping. Simon, not only are you stylish but you are so good looking you make me weak in the knees. You must be taking the piss! I don’t have a linen suit but all my casual linen shirts never stay in shape, they get “deformed” after some time. 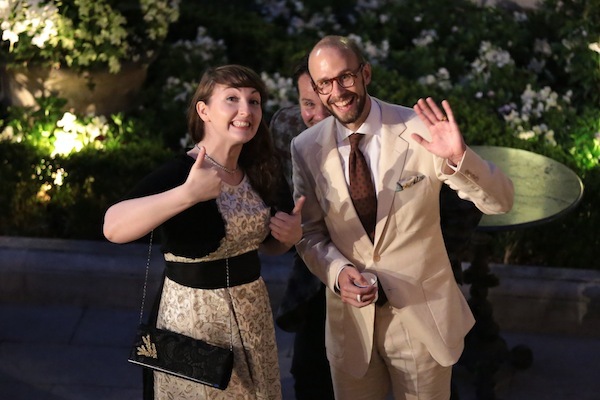 What is it like with linen suits? They look great on day one and great from day 10 onwards. Just get through the days in between. Hi Simon, love your blog, it’s fantastically educational and I’ve learnt a lot on tailoring and general style when dressing from you. I was wondering if I could ask you something concerning stitching within a tailored garment. specifically I have noticed (being someone with a slightly obsessive personality) that occasionally stitching in a jacket is not done tightly and flush to the cloth, but instead in a very loose way to allow two areas of cloth to have a bit of play with each other. What is the purpose of this as it seems a bit risky to join two pieces of cloth with a single thread holding them together in such a way? I have also noticed that often when this stitching is deployed one end of the thread merely ends and is found poking out of the cloth and not secured at the end (with a knot or by stitching over and over itself. is there a reason for this as I don’t understand why the end of a thread would not be secured to make it more sturdy as it’s just a little extra work. I have found this kind of this on high end ready to wear sport jackets (loro piana as well another Italian made garment) which are at the top end of the RTW spectrum so find it a bit odd, am I missing something Simon? It would depend very much on where on the jacket the stitching is. The lining is often attached at the bottom with loose stitches on a bespoke jacket, for instance, to give it some movement and because it doesn’t come under much pressure. High-end RTW jackets replicate that with loose, but machined stitches. Having a loose end just sounds lazy though. i recently bought a blazer in the rtw section at huntsman and saw similar thing done, funny thing is its on part of the inside lining which doesnt even need any stiching imo – there are these two oval shaped patches of lining under the armholes (no idea what these are for? they are like pads) which are well secured to the lining at the top side but at the bottom of them they have done this loose stiching with one end of thread left loose. you wouldnt even be able to see it unless you lift the pads up and take a look. tbh you dont need any stiching here anyway so im not that concerned but i just thought it looked a bit tacky tbh and poor finishing esp as they have bothered to do all sorts of other little things like put thread for a boutonniere, complex folds in the lining, pick stiching etc .. i dont think its something which has come undone as its the same on both sides ..
im questioning whether to take it back and ask them to secure it, alternatively im wondering whether to get out a needle and thread and do some amateur tailoring, who knows this might be the start of a fantastic new career and i could be making suits for you one day! Those are intended to soak up sweat, some tailors use them, particularly in Asia. I couldn’t comment on the stitching without seeing it, but it’s unlikely it’s meant to be loose at the end. Perhaps leave it – if it comes loose you can certainly get it repaired. I think Huntsman’s RTW is made by Cheshire Bespoke, so it should be good quality. Is one supposed to iron a linen suit between wearings? Indeed can that be safely done? Certainly not between all wearings, no. It can be ironed occasionally, but you would need a cloth and a low heat. And much better would be a steaming. And better than that, a sponge and press from the tailor who made it. Ah .. sweat pads! Thanks for the heads up simon, was wondering what they were for, wasnt sure if they were meant as some kind of arm support! It does seem v well made in all other respects, its a small thing & a tailor could prob sort quite easily i imagine, but its nice when you know all the details have been taken care off .. and there are no loose ends left (forgive the pun)! your blog is awesome by the way simon. there’s nothing like it out there. the only problem is reading it is making my taste in clothing expand faster than my bank account. Hi Simon, many thanks for your blog. Could you share the reference of this WBill linen cloth ? Hi Hugo – sure, I can ask Terry. There’s only one W Bill linen bunch though so you should be able to find it fairly easily. What price do KH&L bespoke suits usually start at? Hi Simon, could you possibly tell me what number the cloth is in the W Bill bunch. It is very easy to get the shade wrong with creme linen suits. I believe that you have really excelled with the selection of colour here. It’s a balancing act – lighter linens are fine, but they will look very wrinkled very quickly. I like heavier linens because they still hold a line and shape, which becomes more important when you’ve had a bespoke fit to try and create that shape in the first place. Fantastic suit. I’m considering something similar (a bit more beige, so slightly darker) for summer. It looks like this event was early in the evening. Would you wear such a light coloured suit in the evening? (not a formal event like a wedding, but say a meal or reception). Or are dark colours always more appropriate, even in summer? In regards to creasing, what do you think about linen /mohair blends such as those from Harrison’s of Edinburgh? Is John Kent still active in this company? Their current website is not very informative. And do you still consider KH&L the best value on the row? Are you thinking of their London made or India made product? Is the former also better value? Thanks. What are current KH&L prices? I don’t know I’m afraid, you’ll have to check. Do you know if John Kent is still active? I’ve been thinking of having a suit made by him.